Last year she was charged with rebellion and illegally occupying land, and sentenced to two and a half years in prison. She was released on appeal after two months. "I've been detained by the police five times," she told me in the house next to the drained lake that the women use as a campaign headquarters. "The last time I was sentenced to jail. This is normal in my country. Before I started this work I thought hard about what I would face, but I knew I could not back down. I had to fight the corrupt officials and the greedy companies which are harming the lives of our people." More than 4,000 families were evicted from the area around the lake, which has since been filled with sand. There was no prior consultation, and the World Bank responded by suspending all loans to Cambodia in August 2011. The government then ordered the company to allocate a small portion of land to some of the evicted families, but there are still more than 60 families who have been excluded. Tep Vanny and her movement have vowed to keep protesting until all the families have replacement homes. They are also supporting other poor Cambodians who have lost homes to the country's breakneck development. There are plenty of them. Tim Sakmony is a 64 year-old grandmother and, like Tep Vanny, she has also spent time in jail. 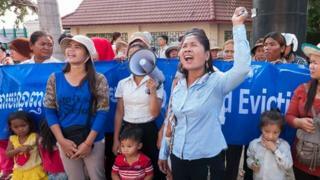 She lives in Borei Keila, and has led the families protesting against their exclusion from the deal under which Phanimex would be allowed to redevelop the site in return for building 10 apartment blocks for the displaced residents. The company only built eight. Tim Sakmony was given a six-month sentence for "making a false declaration", a complaint filed by the owner of Phanimex. She was released after three months, but still cries when she talks about her treatment. "I went to see the owner of Phanimex, to claim a home for my son, who is disabled and cannot speak for himself. After that I was summoned to court." "I thought it was an opportunity to explain about my case. But the judge sentenced me to six months." She and her son, a former soldier who bought a small plot of land at Borei Keila, are now living with his 12 year-old twins in the stairwell of one of the completed apartment blocks. The area lies next to a festering rubbish dump. A few hundred metres away, upmarket apartments are under construction. Last year the government responded to international pressure over widespread land grabs by politically-connected companies by authorising a project to give land titles to 470,000 people. Image caption Tim Sakmony spent three months in jail for "making a false declaration"
But the student volunteers carrying out the project are only allowed to work on uncontested land. That excludes the many thousands of Cambodians who are fighting eviction. Human rights groups estimate that 700,000 people have been adversely affected by land development, and they say the government and the courts openly side with the developers. Speaking about the case of Yorm Bopha, another activist who was jailed for three years for protesting against the evictions from Boeng Kak, Brad Adams of Human Rights Watch said this week that "a politically controlled judiciary has targeted a brave woman who has the audacity to challenge powerful interests and people".